Metropol & Food Bank Albania Theater invites to join their great initiative of donating foods and get a ticket discount for the “Twelfth Night" show. For all those who will attend the "Twelfth Night" show, from January 18 to February 4, the Metropol Theater offers a 40% discount on the ticket price if you donate one or more food products to the families in need. How can you participate? When booking a theater ticket on the web, by phone or on the ticket desk, just say "I will give away food". Bring one or a few of the essential food products when you come to the Theater on the day of the show. By submitting your donation to the "Food Bank Albania Basket", you will immediately receive a 40% discount on the ticket price of the theater, paying it 300 ALL unlike the standard ticket price of ALL 500. 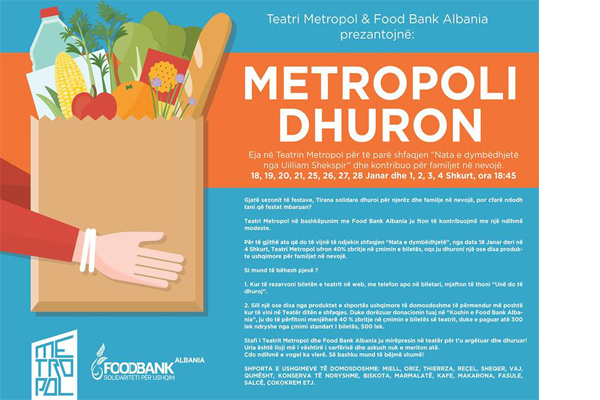 Metropol Theater Staff and Food Bank Albania welcome you to the theater to have fun and donate! Every little help is worth. Together we can do a lot!